Singet frisch und wohlgemut, Op. 12/4 (Motet for Christmas). 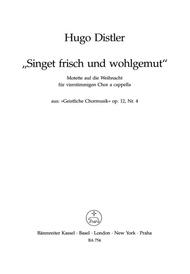 Composed by Hugo Distler (1908-1942). For SATB choir. This edition: 19th printing 2011 edition. Stapled. No. 4 from "Geistliche Chormusik" (1934-1941. Sacred. Level 4. Choral score. Opus 12/4. Published by Baerenreiter Verlag (BA.BA754).ISBN 9790006405190. Sacred. 27 x 19 cm inches.